This category singles out the worst in individual acting performances in a year. Often these are entirely competent actors, miscast, misdirected or otherwise stranded in miserable material that no one could save (indeed, a full half of the category are former Oscar winners or nominees). And yet: they had the chance to say no. It's really only fair and proper that we call them out for this. As for the other half of this category, well, naturally bad actors need to be noticed too. Leading this category by a single point is Emma Thompson in Beautiful Creatures as Sarafine, the leader of the evil faction of “casters”. Or rather, the possessed version of Sarafine, because to take form... wait, you don't care. 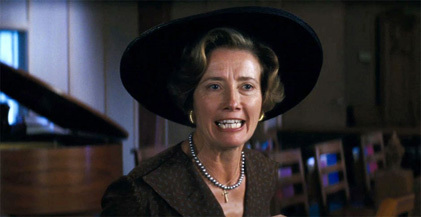 At any rate, in a year in which she received a lot of acclaim for playing the creator of Mary Poppins, here she plays the polar opposite of Mary Poppins, sneering and howling her way through the role, proving that broad villainy is probably not among her great talents as an actress. That, or perhaps after she read the script, she decided to at least make her scenes have some life to them, She's not alone in her badness in this cast (three actors from this film make our top 10), but in this case her very loud badness makes the difference. Second place goes to Selena Gomez in Getaway. Stranded in a car chase for about 90 minutes, Gomez seems unable here to find a second emotion beyond “bored”. Perhaps she's simultaneously watching the movie while acting in it, but that seems somewhat farfetched. There's also the sense that she never really bothered to learn her lines, and is reading them off the car's GPS navigation, like a bad host on Saturday Night Live reading cue cards. Accents often trip up actors, southern ones in particular. That's a large part of what lands Alden Ehrenreich in third place for his performance in Beautiful Creatures, though it's not just his butchering of natural speech patterns that we found terrible. Caught in the middle of a clash between good and evil and facing the prospect of being killed for love, he seems more bemused at the whole thing, as if supernatural battles happen to him all the time. It's quite a puzzling performance, and just because you know things turn out OK for your character, it's no reason to take the rest of the movie off.